2007 Adria Vini Barbera da Vine: Retail $15. There is probably nothing I hate more than looking like an idiot. I bid on this wine on an online auction site without doing my due diligence and researching the wine. It turns out the wine went for about $5 on Last Bottle and I paid close to twice that. Moron. The wine was fine, and certainly “worth” $10. But it would have tasted so much better at $5. Good. 84-86 Points. NV Cave des Producteurs de Vouvray Vouvray C. Greffe Rosé: Retail $20? I got a case of this for $8/bottle and this is pretty darn good. My previous note: This continues to be a solid sparkler at a really good price (got it on closeout for $8). Ample fruit, good acidity, and vibrant bubbles–what else do you want for $8? OK, it’s also a rosé. Very Good. 86-88 Points. 2012 Couly-Dutheil Chinon Rosé Domaine René Couly: Retail $25. Alright, this is getting serious. I originally liked this wine, but it has grown into more than that. I bought two cases for me and a few others, but I think I am going to keep it all for myself. Does that make me a bit of a jack-rabbit? Yes. But I like the wine that much (despite its synthetic cork). Outstanding. 90-92 Points. 2009 Domaine Drouhin Oregon Chardonnay Arthur: Retail $35. Another wine that we revisited this week. We last had this in July (remember July?!?) Much better this time around–vanilla, lemon and pineapple blended together on the nose. The vanilla and lemon rind persist on the palate with a touch of oak on the finish. The extra time seems to have helped here as the wine is drinking very well. Outstanding. 90-92 Points. 2011 Domaine Durand Cornas Premices: Retail $40. Another “jack-rabbit” moment. I took this bottle of French Syrah to my son’s school auction to be put up for sale. After nearly two hours of sitting there in its paper bag, I decided to “rescue” it. I grabbed a couple of pals, went to the bar, and popped this puppy. Tons of barnyard on the nose, but very nice fruit on the palate. the finish was lingering and inviting. I was sad to see the bottle drained dry. Very Good to Outstanding. 89-91 Points. 2008 Mumm Napa Pinot Noir Napa Valley: Retail $30. I kept seeing this in my inventory. I kept thinking that I should drink it. I kept looking for it, but kept failing to find it. I finally called off the search and pronounced it officially “dead”. I wept. 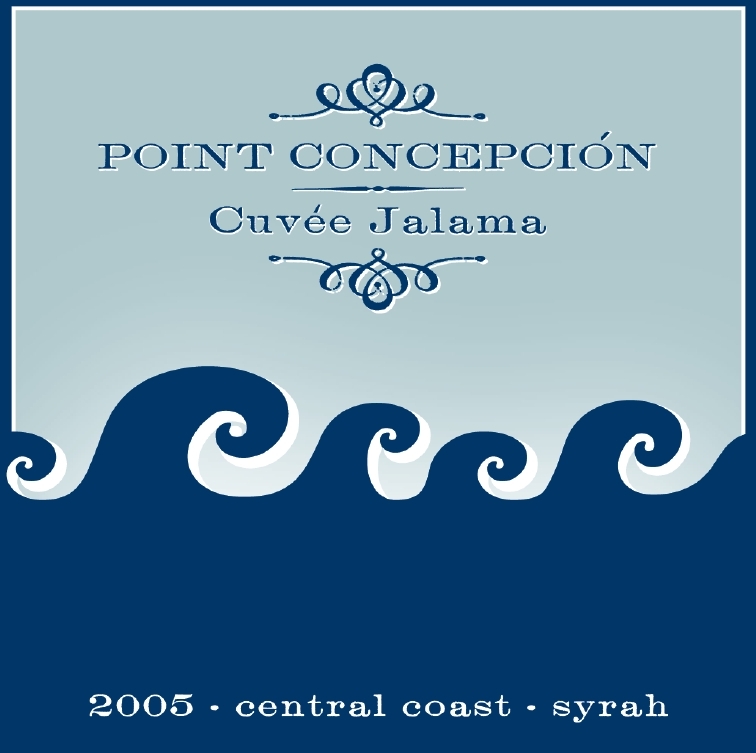 2005 Point Concepción Syrah Cuvée Jalama: Retail $30? Whoa. I know I say “Whoa” quite a bit, but this time it is certainly warranted. This was the best bottle of this wine so far: Really rich fruit, but great balance and complexity. I really could not believe how truly great this wine was. Outstanding. 91-93 Points. 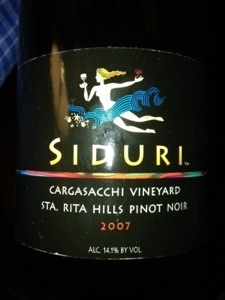 2007 Siduri Pinot Noir Cargasacchi Vineyard: Retail $50. I got these for a bit of a song from the PLCB a couple of years ago and this was the first I tried. I am a big fan of both Siduri and Cargasacchi and this was just what I imagined–great fruit with depth and personality. The finish? Incredible. Outstanding. 92-94 Points. WINE(s) OF THE WEEK: This week was a bit different in that my wife was out of town at a conference. I was in charge of keeping the kids alive, so I had to cut back a bit on the wine. My wife also gets a bit ticked off if I drink any really nice bottles when she is gone, so a choosing a clear-cut Wine of the Week was going to be a challenge. Thus, as I was sitting on the couch, contemplating that very dilemma, I did what just about every red-blooded wine lover would do–I defied my wife’s wishes, went down to the cellar, and pulled out a really nice bottle of Pinot. And the 2007 Siduri Cargasacchi was just that–in fact it was spectacular. While I was slightly worried that my wife would seek retribution for opening an outstanding wine without her, I was just happy that I had a Wine of the Week. Well, a funny thing happened as I was compiling these notes: I remembered the 2005 Point Concepcion Syrah Cuvée Jamala that we had way back on Monday. It was surprisingly both bold and nuanced with jammy raspberries and earthy grit. While obviously different wines, they both had, to differing degrees, the influence of one Peter Cargasacchi at the core. So instead of splitting hairs, I have decided to declare them both “Wine of the Week.” I hopefully will be visiting Cargasacchi for the first time this summer, right after the Wine Blogger’s Conference. This entry was posted in Barbera, Cabernet Franc, Chardonnay, Pinot Noir, Rosé, Sparkling Wine, Syrah, Wine and tagged Adria Vini Barbera, online auction site. Bookmark the permalink. Thank you so much for both your kind words and for passing along my little blog to some of your friends. I apologize in advance if they opt to no longer be associated with you after learning that you pass your time reading my alcohol-induced ramblings…. Whoa. Krug?!? Don’t you have my phone number? Ah yes, nicely put, evoyerne.